If you feel enticed to have your own indigo vat, I'm happy to share a few tools that I use, and offer some basic tips. If you're a beginner, see the great instructions from Maiwa, and then read every entry in Catharine Ellis' blog (at least twice). For a small 1-2 liter vat, get a tall, stainless steel asparagus pot with a strainer, or a 2 liter jar. Then find a meat baster, a thermometer (preferable Celsius and Fahrenheit). The baster is useful for checking the color of the vat, if your container isn't clear glass. Color of a henna vat should be this gold found under the surface. I use a 6-gallon bottling bucket made for home brewing. It has a spigot about 1.5" up from the bottom, so I can tap off the excess solids every so often. 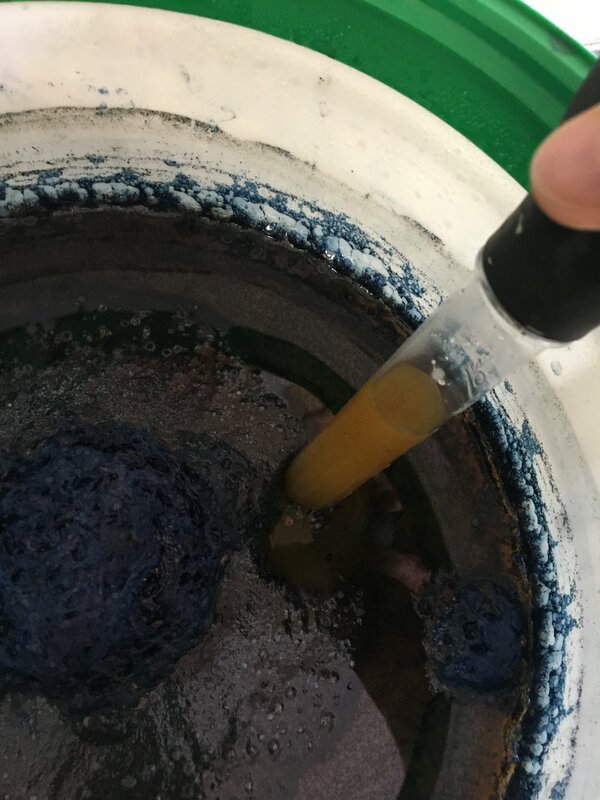 I re-heat this sludge and tease out more indigo in my small asparagus pot and then add it back to the larger vat. I wrap the bucket with one of those auto windshield insulation things. I put a "Grit Guard" in the bottom to hold any fabric up from the solids that settle in the bottom 2" of the vat.